The Syrian Foreign Ministry said that Damascus supports Russia's proposal on de-escalation zones. BEIRUT (Sputnik) — Damascus supports Russia's proposal on de-escalation zones in Syria, the Syrian Foreign Ministry said in a statement on Wednesday. "For the sake of ending the bloodshed of the Syrian people, beginning with the readiness for any proposals conducive to the return of the Syrian people to peaceful life… The Syrian Arab Republic supports Russia's proposals for creating zones of reduced tensions and pledges to implement the ceasefire agreement signed on December 30, 2016," the statement said. On May 1, a source in the Syrian opposition delegation told Sputnik about Russian proposals on settlement in Syria. Documents received from the source state that Russia proposes to create four zones for reducing tension in Syria: in the Idlib province, north of the city of Homs, in Eastern Ghouta and in the country's south. 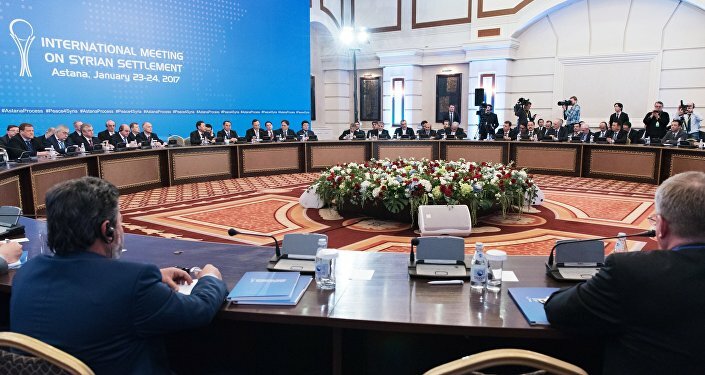 The fourth round of international talks on Syria kicked off in Astana on Wednesday. The talks are to last two days, on Thursday meetings of delegations in bilateral formats will continue, after which a general plenary session is scheduled. Following the meetings, there are plans to adopt a number of documents, including on four safe zones in Syria.